This article is about the 17-campus public university system in North Carolina. Some references to the "University of North Carolina", such as in NCAA college athletics, may be specifically referring to the university's founding campus. For that campus, see University of North Carolina at Chapel Hill. For that school's athletic program, see North Carolina Tar Heels. The University of North Carolina is a multi-campus public university system composed of all 16 of North Carolina's public universities, as well as the NC School of Science and Mathematics, the nation's first public residential high school for gifted students. Commonly referred to as the University of North Carolina System or the UNC System to differentiate it from the original campus in Chapel Hill, the university has a total enrollment of over 183,001 students[when?] and in 2008 conferred over 75% of all baccalaureate degrees in North Carolina. UNC campuses conferred 43,686 degrees in 2008–2009, the bulk of which were at the bachelor's level, with 31,055 degrees awarded. Founded in 1789, the University of North Carolina at Chapel Hill is one of three schools to claim the title of oldest public university in the United States. It closed from 1871 to 1875, faced with serious financial and enrollment problems during the Reconstruction era. In 1877, the State of North Carolina began sponsoring additional higher education institutions. Over time the state added a women's college (now known as the University of North Carolina at Greensboro), a land-grant university (North Carolina State University), five historically black institutions (North Carolina A&T State University, North Carolina Central University, Winston-Salem State University, Fayetteville State University, and Elizabeth City State University) and one to educate American Indians (the University of North Carolina at Pembroke). Others were created to prepare teachers for public education and to instruct performing artists. During the Depression, the North Carolina General Assembly searched for cost savings within state government. Towards this effort in 1931, it redefined the University of North Carolina, which at the time referred exclusively to the University of North Carolina at Chapel Hill; the new Consolidated University of North Carolina was created to include the existing campuses of University of North Carolina at Chapel Hill, North Carolina State University, and the University of North Carolina at Greensboro. The three campuses came under the leadership of just one board and one president. By 1969, three additional campuses had joined the Consolidated University through legislative action: the University of North Carolina at Charlotte, the University of North Carolina at Asheville, and the University of North Carolina at Wilmington. In 1971, North Carolina passed legislation bringing into the University of North Carolina all 16 public institutions that confer bachelor's degrees. This round of consolidation granted each constituent institution a Chancellor and a Board of Trustees. In 1985, the North Carolina School of Science and Mathematics, a residential high school for gifted students, was declared an affiliated school of the university. In 2007, the high school became a full member of the university. UNC Charlotte. The university expanded significantly in the 1960s and 1970s. The state legislature did not get around to granting a charter for the University until 1789. Article IX of the current version of the North Carolina Constitution deals with all forms of public education in the state. Sections 8 and 9 of that article address higher education. Sec. 8. Higher education. Sec. 9. Benefits of public institutions of higher education. Statutory provisions stipulate the current function and cost to students of the University of North Carolina. Within its seventeen campuses, UNC houses two medical schools and one teaching hospital, ten nursing programs, two schools of dentistry, one veterinary school and hospital, and a school of pharmacy, as well as a two law schools, 15 schools of education, three schools of engineering, and a school for performing artists. The oldest university, the University of North Carolina at Chapel Hill, first admitted students in 1795. The smallest and newest member is the North Carolina School of Science and Mathematics, a residential two-year high school, founded in 1980 and a full member of the University since 2007. The largest university is North Carolina State University, with 34,340 students as of fall 2012. While the official names of each campus are determined by the North Carolina General Assembly, abbreviations are determined by the individual school. The enrollment numbers are the official headcounts (including all full-time and part-time, undergrad and postgrad students) from University of North Carolina website: https://web.archive.org/web/20100527154058/https://www.northcarolina.edu/web/facts.php . This does not include the North Carolina School of Science and Mathematics, the figure for NCSSM is taken from its own website: https://web.archive.org/web/20080919063321/http://www.ncssm.edu/about-ncssm/facts.php . With the exception of the University of North Carolina at Pembroke and the University of North Carolina School of the Arts, the institutions that joined the University of North Carolina in 1972 did so under their current name. As of 1972, all public four-year institutions in North Carolina are members of the University. For presiding professors of the University of North Carolina prior to 1804, see Leaders of the University of North Carolina at Chapel Hill. An asterisk (*) denotes acting president. ^ a b "UNC Employees" (PDF). UNC System. Archived from the original (PDF) on 2011-07-20. Retrieved 2010-08-14. ^ "Facts & Figures". UNC System. Archived from the original on 2010-05-27. Retrieved 2010-08-14. ^ a b "Facts & Figures". Northcarolina.edu. Archived from the original on 2010-05-27. Retrieved 2010-08-14. ^ a b "University Facts". University of North Carolina. 2008-01-10. Archived from the original on 2008-02-13. Retrieved 2008-03-18. ^ "About UNC". UNC General Administration. Archived from the original on 2011-05-11. Retrieved 2011-02-16. ^ "Facts & Figures". UNC General Administration. Retrieved 2010-08-14. ^ "Article IX". North Carolina Constitution. North Carolina General Assembly. 2006. Retrieved 2008-06-09. ^ "Chapter 116 - Higher Education". North Carolina General Statutes. North Carolina General Assembly. 2006. Retrieved 2008-03-29. ^ "Appalachian State University" (PDF). Institutional Profiles. University of North Carolina. 2007. Retrieved 2008-03-18. ^ "Appalachian State University" (PDF). Carnegie Classifications. The Carnegie Foundation for the Advancement of Teaching. 2007. Retrieved 2008-03-18. ^ "East Carolina University" (PDF). Institutional Profiles. University of North Carolina. 2007. Retrieved 2008-03-18. ^ "East Carolina University" (PDF). Carnegie Classifications. The Carnegie Foundation for the Advancement of Teaching. 2007. Retrieved 2008-03-18. ^ "Elizabeth City State University" (PDF). Institutional Profiles. University of North Carolina. 2007. Retrieved 2008-03-18. ^ "Elizabeth City State University" (PDF). Carnegie Classifications. The Carnegie Foundation for the Advancement of Teaching. 2007. Retrieved 2008-03-18. ^ "Fayetteville State University" (PDF). Institutional Profiles. University of North Carolina. 2007. Retrieved 2008-03-18. ^ "Fayetteville State University" (PDF). Carnegie Classifications. The Carnegie Foundation for the Advancement of Teaching. 2007. Retrieved 2008-03-18. ^ "North Carolina Agriculture and Technical State University" (PDF). Institutional Profiles. University of North Carolina. 2007. Retrieved 2008-03-18. ^ "North Carolina Agriculture and Technical State University" (PDF). Carnegie Classifications. The Carnegie Foundation for the Advancement of Teaching. 2007. Retrieved 2008-03-18. ^ "North Carolina Central University" (PDF). Institutional Profiles. University of North Carolina. 2007. Retrieved 2008-03-18. ^ "North Carolina Central University" (PDF). Carnegie Classifications. The Carnegie Foundation for the Advancement of Teaching. 2007. Retrieved 2008-03-18. ^ "North Carolina State University" (PDF). Institutional Profiles. University of North Carolina. 2007. Retrieved 2008-03-18. ^ "North Carolina State University" (PDF). Carnegie Classifications. The Carnegie Foundation for the Advancement of Teaching. 2007. Retrieved 2008-03-18. ^ "University of North Carolina at Asheville" (PDF). Institutional Profiles. University of North Carolina. 2007. Retrieved 2008-03-18. ^ "University of North Carolina at Asheville" (PDF). Carnegie Classifications. The Carnegie Foundation for the Advancement of Teaching. 2007. Retrieved 2008-03-18. ^ "Serving UNC students and the community since 1893". The Daily Tar Heel. 2010-07-08. Retrieved 2010-08-14. ^ Oh, Four Oh Four[permanent dead link]. Media.www.dailytarheel.com. Retrieved on 2013-07-29. ^ "University of North Carolina at Chapel Hill" (PDF). Institutional Profiles. University of North Carolina. 2007. Retrieved 2008-03-18. ^ "University of North Carolina at Chapel Hill" (PDF). Carnegie Classifications. The Carnegie Foundation for the Advancement of Teaching. 2007. Retrieved 2008-03-18. ^ "University of North Carolina at Charlotte" (PDF). Institutional Profiles. University of North Carolina. 2007. Retrieved 2008-03-18. ^ "University of North Carolina at Charlotte" (PDF). Carnegie Classifications. The Carnegie Foundation for the Advancement of Teaching. 2007. Retrieved 2008-03-18. ^ "University of North Carolina at Greensboro" (PDF). Institutional Profiles. University of North Carolina. 2007. Retrieved 2008-03-18. ^ "University of North Carolina at Greensboro" (PDF). Carnegie Classifications. The Carnegie Foundation for the Advancement of Teaching. 2007. Retrieved 2008-03-18. ^ "University of North Carolina at Pembroke" (PDF). Institutional Profiles. University of North Carolina. 2007. Retrieved 2008-03-18. ^ "University of North Carolina at Pembroke" (PDF). Carnegie Classifications. The Carnegie Foundation for the Advancement of Teaching. 2007. Retrieved 2008-03-18. ^ "University of North Carolina at Wilmington" (PDF). Institutional Profiles. University of North Carolina. 2007. Retrieved 2008-03-18. ^ "University of North Carolina at Wilmington" (PDF). Carnegie Classifications. The Carnegie Foundation for the Advancement of Teaching. 2007. Retrieved 2008-03-18. ^ "North Carolina School of the Arts" (PDF). Institutional Profiles. University of North Carolina. 2007. Retrieved 2008-03-18. ^ "North Carolina School of the Arts" (PDF). Carnegie Classifications. The Carnegie Foundation for the Advancement of Teaching. 2007. Retrieved 2008-03-18. ^ "Western Carolina University" (PDF). Institutional Profiles. University of North Carolina. 2007. Archived from the original (PDF) on 2008-11-21. Retrieved 2008-03-08. ^ "Western Carolina University" (PDF). Carnegie Classifications. The Carnegie Foundation for the Advancement of Teaching. 2007. Archived from the original (PDF) on 2008-11-21. Retrieved 2008-03-08. ^ "Winston-Salem State University" (PDF). Institutional Profiles. University of North Carolina. 2007. Retrieved 2008-03-18. ^ "Winston-Salem State University" (PDF). Carnegie Classifications. The Carnegie Foundation for the Advancement of Teaching. 2007. Retrieved 2008-03-18. ^ "North Carolina School of Science and Mathematics". Retrieved 2008-03-29. ^ "NCSSM Fast Facts". North Carolina School of Science and Math. Archived from the original on 2008-09-19. Retrieved 2010-08-14. ^ Spellings has announced her resignation. William Roper will become interim president in January 2019. McGrath, Eileen, and Linda Jacobson. "The Great Depression and Its Impact on an Emerging Research Library: The University of North Carolina Library, 1929–1941," Libraries and the Cultural Record, (2011), 46#3 pp 295–320. 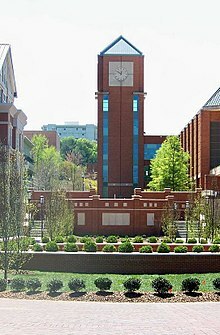 Wikimedia Commons has media related to University of North Carolina at Charlotte. Wikisource has the text of a 1905 New International Encyclopedia article about University of North Carolina. "North Carolina, University of" . Collier's New Encyclopedia. 1921.